The easiest way to sell your Mannatech products. Hands down. Ready to set your business in motion? The all-in-one system to help you market and sell your Mannatech products online. We created Mannamotion to be the easiest way to educate your clients and send them exactly what they want – rather than having them search for AmbroTOES or Ambrosia on the product list. Through Mannamotion you can send custom emails, social media posts or texts with products in cart and attach videos, product information sheets and links to MannatechScience. Yes, you read that right…all in one email, post or text! It’s time to simplify the way we do business by educating our potential clients and helping them sign up seamlessly. This is a 3rd party tool made by associates for associates. Keep clients tied to your account each step of the way. One stop shop for marketing, education and sign ups! Get clients while you sleep! You choose which products and videos you want to feature. Associate sign up link also available. Choose to lead with products or business. Sharing has never been easier. Website, Emails, Social and even Texting. Custom emails includes scheduling and saved templates. Market around the world by hosting multiple countries. All the information they need in one spot! 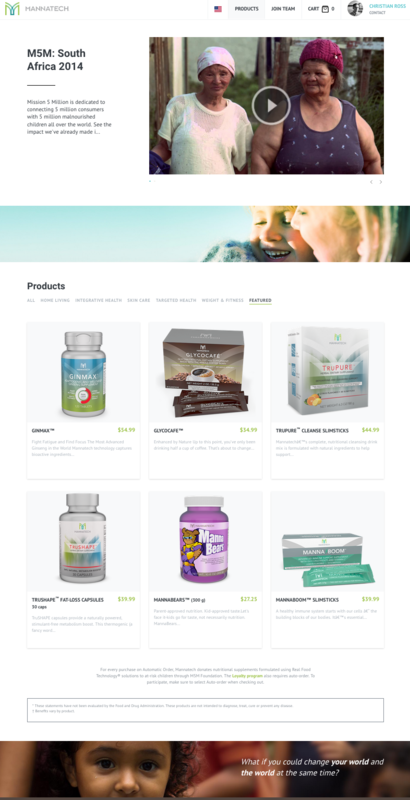 Have your own website for marketing your Mannatech products and choose your favorite products to feature. When visitors come to your site from a Mannamotion email or social share, the website will automatically adjust to the content of what you have shared with them. Shared videos will be added to your list and shared products will override the featured list. It's like magic! Send beautiful customized emails to prospects. Recipients will receive exactly what they need to learn more and make their first purchase. They will be really impressed with your professionalism. Send yourself a sample now! Are you looking for a basic storefront or are you ready to take your business to the next level? Provide basic contact information, Mannatech number and subscription payment. Build your site with products, videos and other options to fit your needs. There are many powerful ways to begin sharing your products and business with others. We’re not hiding anything. We’ve got two plans, and yes, one is free. Good business model, eh? We’ll never put an ad on your cart, we’ll never sell your data, and we don’t take any transaction fees on your sales. In 5 minutes, you should have a fully functional cart to promote your business and sell your products. MannaMotion is an approved vendor of Mannatech, Inc and we swear by the products. Any statement regarding Mannatech product successes have not been evaluated by the Food and Drug Administration. These products are not intended to diagnose, treat, cure or prevent any disease. MannaMotion’s only goal is to make your job of marketing and selling Mannatech products the most painless possible. We don’t take transaction fees off of your sales, we don’t get kick-backs from Mannatech, Inc., and we certainly don’t abuse your data. We’re good guys with a goal of helping you grow your business. Want to get in touch, fill out our fancy contact form. Learn how to communicate with your prospects with our email powerful tool. Learn how to connect with your prospects via Facebook with MannaMotion. Learn how to send videos and product links via text on your phone with MannaMotion. In this video, you will learn how to manage your contacts in MannaMotion. We want to give you a copy of Ray Robbins and Kevin Robbins' book for FREE! That's right, claim your copy of, "Get A Grip" today from MannaMotion for free. Learn how to create and send a text using Mannamotion. We share with you some of the new features that make Mannamotion even better than before and how to get it for free! This video will demonstrate how to update user information on you MannaMotion site. This short video will demonstrate how to select certain products to be featured on your MannaMotion website. This short video will demonstrate how to select videos for your MannaMotion website.